On May 22nd, a Sunday, an extraordinarily diverse range of musicians dragged themselves untimely from their beds to keep playing with the Contagion concepts, this time electronically. The workshop was run by Sam Johnson , presiding genius of CM. It continued to develop the ideas explored by acoustic instruments in the first workshop, developing and applying the musical parameters through digital means and music technology. Sam began with a fascinating account (lavishly illustrated with familiar and unfamiliar tracks) of the development of recording techniques from the 19th century up to the present day, demonstrating the effect records have on the making of music. Then, focussing on the role that technology can play in the creative process, Sam took participants – many of whom had limited experience of working with technology to record and edit music – through some of the incredible range of creative options available in processing sound, applying effects, editing and arranging. 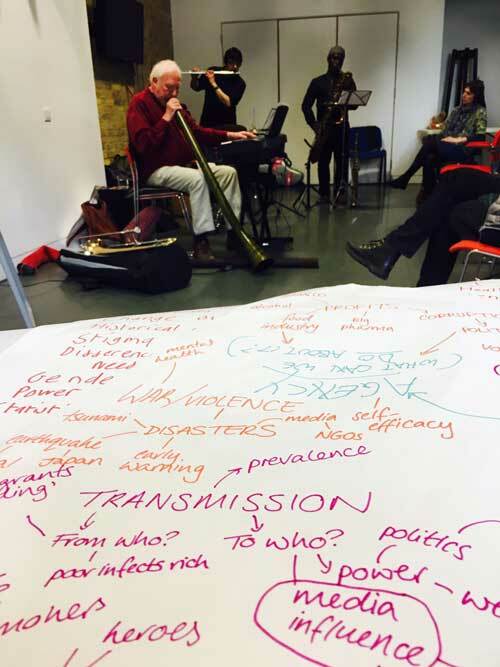 Some instruments, and some of the musical ideas, associated with the previous workshop were then recorded. This material was then manipulated in response to suggestions form the group to create characteristic profiles of diseases; and finally each participant was given their own workstation to try things out for themselves.